Rules & Constitution amendments and new proposals voted in at AGM. Constitution 6. 10 In the event of a team failing to fulfil a fixture but without withdrawing from the league then a 5-0 loss will be recorded against that team with the averages being awarded to the singles players of the non-offending team. Rule 2g If no ball is pocketed from a legal break, then the player’s alternate shots until a ball or balls are pocketed. 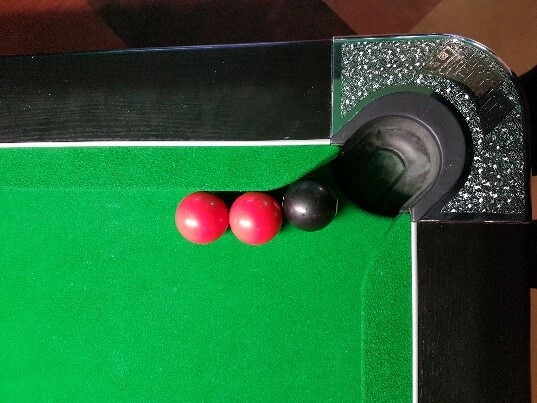 If then one ball from each group is pocketed at the same time no foul is committed and play continues with the player been on the group of colours which was pocketed first. Rule 4c xvii) A trial for this coming winter league season 2017/18 is an introduction of a stop clock for the doubles frames only, this will consist of a 3 minute shot time. The referee will give a warning after 2 minutes has gone with the one minute remaining to take the shot, if the shot isn’t taking in this time then a foul has been committed and two free shots awarded to the opposing players. Note a digital stop watch is to be used only. Rule 7f I) If the black ball roles into the jaws of a neutral pocket when both players are on the black and it is deemed re spottable by the referee per the diagrams marked 7f ii). Then the black will be re spotted one coloured ball width towards the opponents pocket as per diagram 7f iii). Please note this only comes into play when the black ball is NEUTRAL BAGGED during a black ball game. 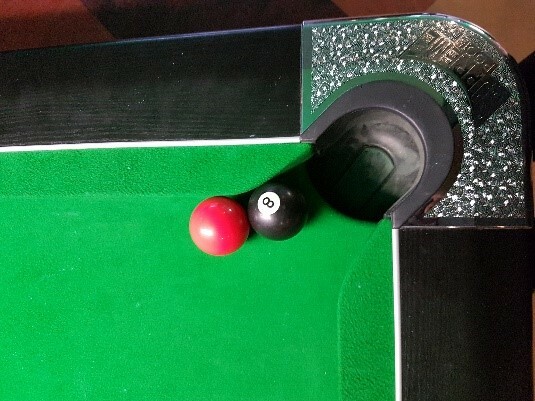 If the situation arises where the player at the table has coloured balls left, once they pocket their final ball it does not constitute a re spot on their first attempt at the black. 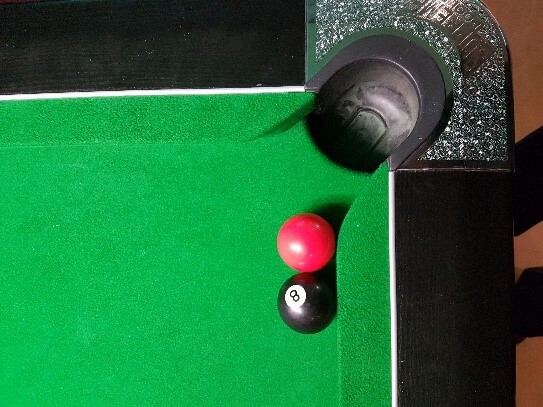 The current ruling 7f comes into play if the referee deems that both players are not attempting to play due to a disadvantage with the location of the balls remaining. Rule 7f Black ball in neutral pocket. 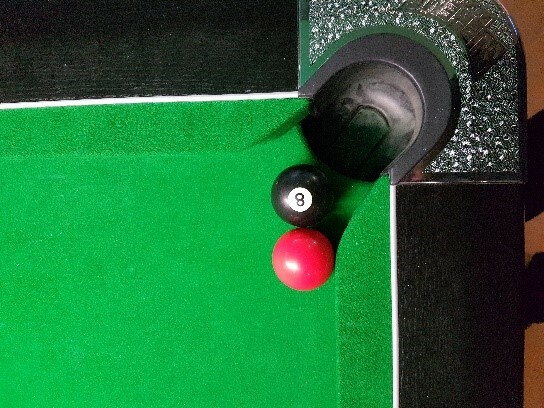 If the black ball rolls into the jaws of a neutral pocket and is (in the opinion of the referee) impossible to play without potting it, the black ball will be re sited by the referee after 3 visits from each player to the table. (This does not apply when both players are on the black ball). 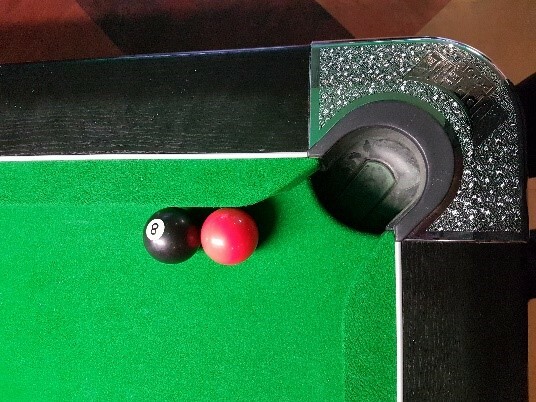 If the players are on corner pockets the black ball must be placed in the middle of the furthest cushion from the pocket of the player who put the black ball in the jaws of a neutral pocket. 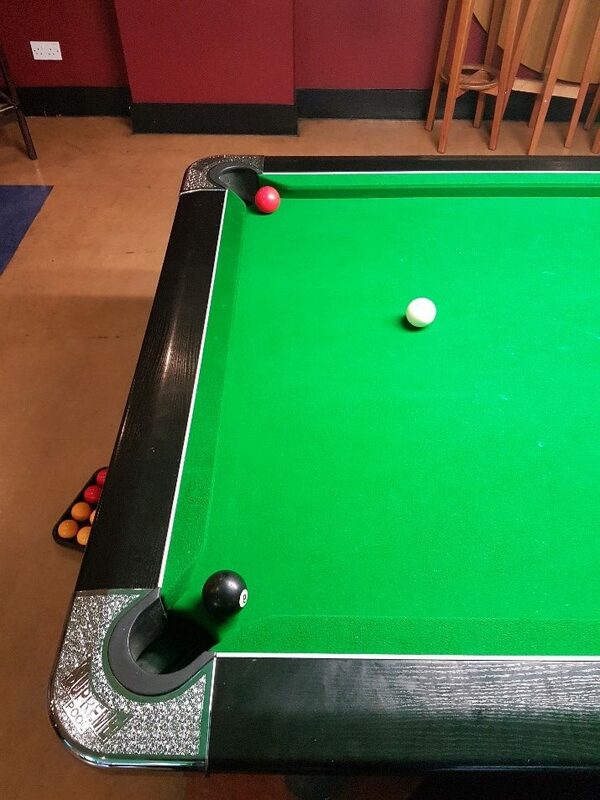 If the players are on middle pockets the black ball must be re spotted on the head spot. Once both players are in a black ball game this ruling comes into place. Once the ball is classed as a “Neutral Bag Ball” in the Jaw, the ball will immediately be re-spotted by the referee – one coloured ball width towards the opponents pocket as per diagram. Please note – this only comes into play when the black ball is “Neutral Bagged” during a black ball game. 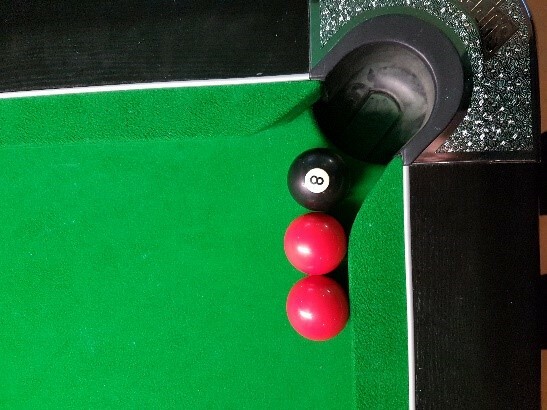 If the situation arises where the player at the table has coloured balls left, once they pocket their final ball it does not constitute a re-spot on their first attempt at the black. Both players are seemingly not willing to pot ball or genuinely attempt to clear black in 3 successive visits. If this is the case then current ruling of 7f comes into play where referee re-spots on head spot or furthest cushion dependent on bag nomination. Player remaining on colours will NOT have a re-spot once their final coloured ball is potted as they are midway through a visit. Winning team responsible for handing results into the Kenny’s or Joiners Arms, on the facebook page or to the Secretary no later than 12 noon the following Saturday. Failure to do so will result in loss of 2 points to winning team.